Designed by Jack Nicklaus and rated in the top 20 golf courses in Gauteng, Houghton Golf Club has a history as a championship facility, having hosted no fewer than eight SA Open events, the first of which took place in 1951. The course was also selected as the chosen venue for the prestigious Alfred Dunhill Championship. The parkland layout is dotted with ponds, dams, well-established trees and flowering shrubs and is situated adjacent to the greenbelt of The Wilds. The Executive Suite and two recently renovated function rooms play host to gatherings from an intimate meeting for up to six people all the way up to catering for up to 50 delegates. The facilities are regularly used for conferences, golf clinics and private celebratory events. The influx of vehicular traffic at this prestigious establishment means that the security of employees, members and guests is often at risk. Turnstar provided a solution that would secure the entrance to the estate. The solution, says Craig Sacks, MD of Turnstar, was the deployment of two 4-metre Talon automatic spike vehicle barriers. 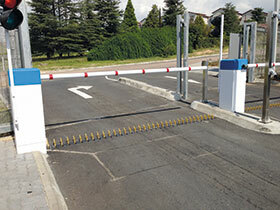 These high-security road spike barriers are particularly suited to applications that require high-volume access control. The installation at the Houghton Golf Club is of a recessed design and the double-sided spikes on the Talon offer protection for traffic in any direction. “We find that most people find the presence of the Talon road spike barrier to be rather intimidating. The driver’s biggest concern is obviously irreparable damage to their vehicle’s tyres. However, the Talon barrier comes complete with a combined logic and loop detector as well as an electronic interlock, which safely lowers spikes first and then raises the barrier arm for safe passage of the vehicle. “In addition, a visual cue is supplied with the traffic light. When it is safe to proceed through the barrier, the green light will be activated. Similarly, when it is unsafe to drive through the barrier, the red light will be activated. Therefore, as long as the driver does not try to drive through the spike barrier and boom before the spikes have been lowered, there is zero risk to the vehicle’s tyres,” says Sacks.